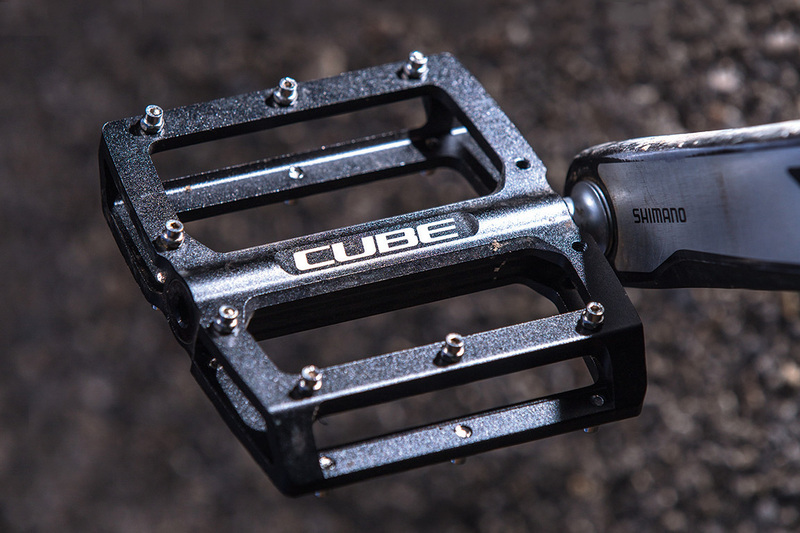 The generic shape of Cube’s flat pedal won’t win any awards for innovation, but it’s a well-proven design that runs on smooth, industrial-grade sealed bearings and bushings, and offers 10 traction studs per side. The 17mm tall alloy body is slightly concave, but I removed the two innermost studs to increase the dished-out feel. With stubby grip studs (rather than narrower pins), even sticky-soled Five Ten shoes could be moved about and repositioned. This is either an advantage or drawback depending on your preference. For a more planted position, thinner, sharper bottom-threading ‘Slug’ pins are available for an extra £5, and these will be less likely to clog with mud or get stuck if damaged. There’s nothing wrong with these pedals, but you don’t have to look very hard to pick up the near identical Superstar Nano tech for less money. Better still, for something as crucial as this contact point, I’d recommend you spend a bit more for a bigger platform and bite from something like the excellent DMR Vault.